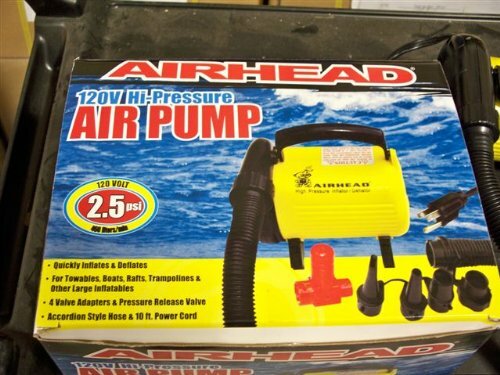 AIRHEAD® Hi-Pressure Air Pump - This is simply the best performing 120 volt air pump available, inflating and deflating at unprecedented speed. Peak pressure is 2.5 psi, plenty of pressure to get high end inflatable boats, rafts and reinforced backyard items nice and firm. You’ll immediately notice how they perform better when properly inflated. A Pressure Release Valve is included to limit pressure to 1.5 psi for preventing over-inflating towables, pool toys and other vinyl and nylon covered inflatable items. The accordion-style hose locks onto the pump, eliminating annoying disconnections. Four universal valve fittings fit all popular valves and lock onto the hose. You’ll love the screw-on Boston Valve adapter, an AIRHEAD exclusive. For added convenience, there’s a carry handle and a 10 ft. long power cord. Draws 6.3 amps. Volume: 460 liters/min. This is the best performing 120 volt air pump available, inflating and deflating at unprecedented speed. Seven universal adapters are provided to fit all valves commonly used on boats, kayaks, towables and other inflatables. A Pressure Release Valve is included to limit pressure to 1.4 psi for preventing over-inflating towables, pool toys. For added convenience, there's a carry handle and a 10 ft. long power cord.